Party speakers are nothing new. But party speakers with lights……..what a game changer. What would a club be like with no strobe lights? 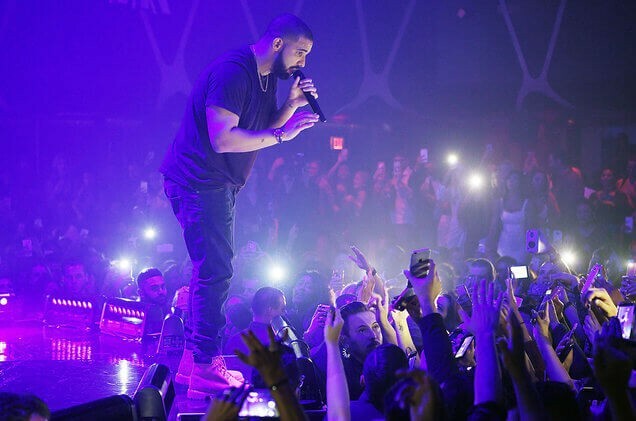 What would a concert be like with no flashing lights? Sure, both venues could have no fancy lights, but would that make the experience any better? People pay for an experience. If that weren’t the case, people wouldn’t go to concerts, they would just go on Spotify and stream their favorite artists. Same thing applies to party speakers with lights. You can put in headphones and turn your light switch on and off (which would be hilarious by the way), but is it the same experience as partying with loud speakers and disco lights? The former sounds like a joke, while the other is an actual experience. We’ve talked about party speakers before. They’re a great addition to any party, and they create a different dynamic compared to if you don’t have one. Although having lights with your speakers isn’t necessary, why not have them? 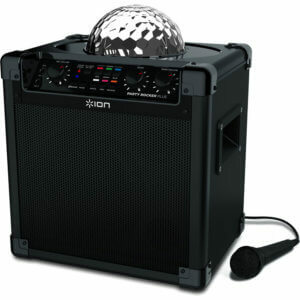 It creates a fun atmosphere with your guests and turns your backyard into a mini nightclub. What’s even better is they’re not that common. So if you have these in your backyard, prepare to impress your guests. So without further ado, here are the best speakers featuring lights we could find. This bad boy has the ingredients to turn your “gathering” into an actual party. To justify what we just said, let us explain the beautiful features on this behemoth. Obviously, it comes with party lights, but what’s even cooler is it moves along with the music. Adding a little more rhythm to your music never hurt anybody, so this is a nice addition to what we already wanted. Furthermore, the lights have 2 different options you can use. The first option is auto, and the other one is app. With the auto option, the light will be going crazy no matter what type of tempo the music is going at. As for the app, you can control the light with a downloaded app on your phone. 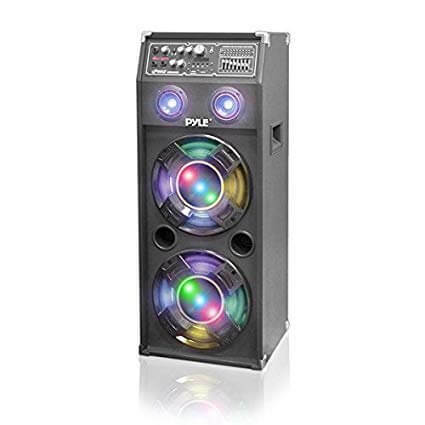 And if that wasn’t enough to satisfy a party animal as yourself, the speaker also comes with a microphone to fill your nights with classic karaoke songs. 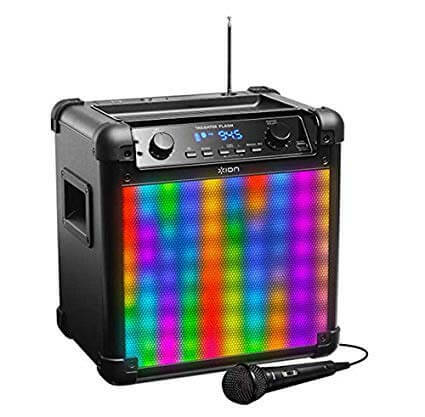 But even if you’re not into karaoke and want to spice it up even more, the speaker also comes with 1/4 inch mono inputs to connect to musical instruments. This is a great addition if you want to throw a mini concert on a low budget. Imagine throwing a party and randomly throwing a live performance by yours truly, or having a guest performer come through and surprising your guests. All of this and more is possible if you purchase this all-in-one party package. Think about it, it might be one of the best investments you ever make. Another speaker but the same brand. Imagine rocking this at a tailgate, which, looking at the name makes sense, but then who would really use those lights during the daytime. Anyways, if its an evening game, this is your speaker. Tailgates are an amazing experience if done right. And what better way to do it then bringing this beast. Complete with 50 watts of “dynamic power”, robust subwoofer, and wide-dispersion tweeter, the only sound this gives is high quality. Add the fact that it comes with a microphone and the party is set. Speaking from experience, this speaker gets really loud. 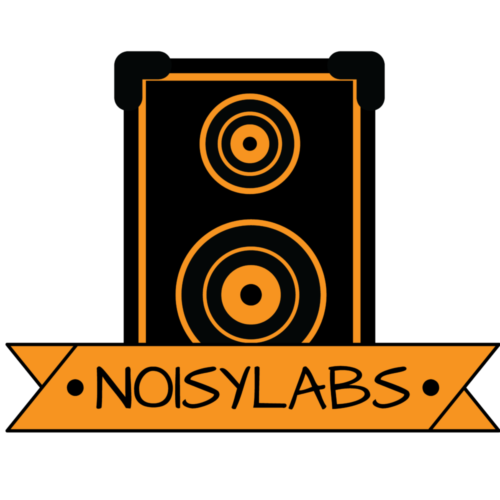 Whether you’re looking for extra bass without extra subwoofers, or you’re just looking for great sound quality. This is worth a pick-up. One noticeable difference with this bluetooth speaker compared to the last one is this one comes with LED (light emitting diode) lighting. Outdoor speaker lighting comes in different forms, and LED is advantageous when it comes to cold weather. The reason why it does better in colder weather is because it becomes more efficient when it’s cold. Another advantage to LED lighting is it doesn’t take time to start meaning there is no warm-up period. Plus, if you’re an environmental friendly person and your loud speaker is outside, it won’t spread mercury or any other harmful substances. A small feature which makes a huge difference is its 2-way design. You can either place it somewhere and lay it down, or stand it up. This is great for safety, and personal preference. If kids are running around all over the place, you can place the speaker on top of a shelf. Aside from that you can just lay it flat if you’re worried about it falling down. A small feature, but nonetheless helpful. As far as musical preference goes, this speaker provides that extra boom (bass). If you’re someone who loves that thump, and you want to elicit a reaction from your guests then this speaker will do. 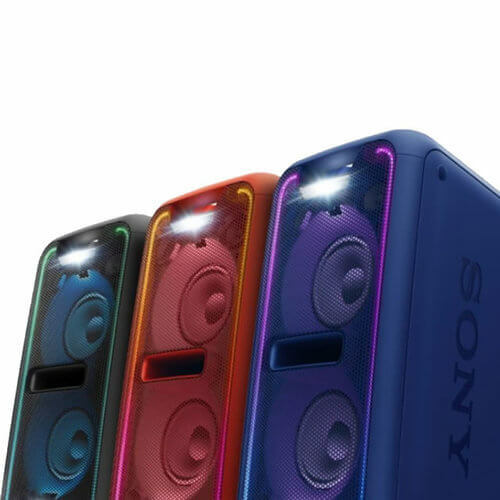 Sony advertises this speaker as having powerful, clear extra bass. And to be clear, it does just that. Take our word for it, this is a great piece of equipment if you want to bring the heat. 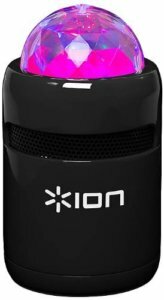 If we think of the ION Audio Tailgater as a millionaire, let’s think of this speaker as Bill Gates in terms of party speakers with lights. What makes this loud speaker so huge in comparison is the wattage. A 1000 watts at its peak is equivalent to 30 decibels which is like sitting in an empty movie house. If that’s not enough to entice you then you must’ve forgot about the DJ lights. In total there are 3 flashing DJ lights which can be controlled at the flip of a switch. It also contains multiple colors so you won’t get blinded by seeing red all night long. By now you’re use to reading about the different light schemes these speakers offer, but this party speaker also has a display screen that shows songs, play time, and frequency. It’s another cool addition which adds to the aesthetics. Another thing to note is its compatibility. Not only is it compatible with tablets, iPhones, and Androids but it also provides a charging port. As for sound quality, the design of the subwoofers are enclosed to add more bass. If you were to stand next to this speaker then you’ll see how much of a difference a change in design makes for added bass. One con we have to point out which is more nit-pick is the way the speaker stands. Unlike the Sony GTK, the only way this speaker stands is vertically. So if you don’t want it getting damaged, make sure you place it in the right place. Party speaker with lights aren’t the most common product. What’s even more uncommon is how small this next product is, and it still has a light installed. For a small outdoor speaker (5×3) it packs a mini punch. Its compact features provide a multi-color feature as part of its lighting. Another feature is it has a long-lasting rechargeable battery. It has the ability to be charged by a USB but if you’re looking for more, that’s pretty much it. Most of its appeal comes in its perceived value. Even though it’s small, it provides great sound quality, and, of course, lights. There isn’t much more to add to this product which can impress you. But if you’re looking for a low budget option, consider putting this on your wish list.